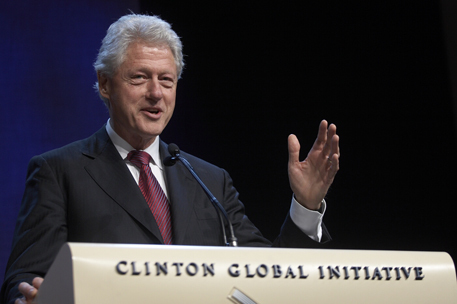 This is the week of the annual Clinton Global Initiative meetings in New York. This series of plenaries and breakout sessions is attended by the most forward-thinking innovators from countries around the world. Leaders of business, politics, charities, and nations gather in a mind expanding brainstorming session to address the biggest issues of our world. It is not just an intellectual exercise—action is taken. Money is pledged by the millions of dollars, new foundations are born, solutions are teased out of the wildest imaginative places, and problems are truly solved. It is the most vibrant, alive, inspiring several days you can imagine…to a power of ten. I attended as press a couple of years ago and was launched out of those hotel meeting rooms like a rocket. Every attendee gets fired up in ways and to a magnitude you cannot imagine. Seeing the meetings and speeches simulcast will not include the truly tangible excitement of being there and wrestling with huge issues, but you can get a flavor here. This year there is a particular focus on joblessness and underemployment around the world, but that is folded in with global hunger, warfare, gender discrimination, education, health, safety, war & peace, access, communication, aging, slavery, and more. There is no politicking thought he presidents and prime ministers of many nations will attend. There is no liberal conservative republican democrat crap gumming up the works…it is leaders and energizers from all sides of any issue or dispute, coming together to solve global issues. Nobody is more dedicated to opposition than they are to humanity–wouldn’t that be a refreshing change of pace if our American politicians could function that way, on our behalf? Drop in on the website, grab a nugget of fire for your belly, and take it out to spark your best ideas into life. Be a part of cracking issues wide open. Five years ago, the first Clinton Global Initiative meetings brought together world leaders, CEOs, heads of the non-profit world, and philanthropists to think big and come up with solutions to the world’s biggest problems. Together each year, people and organizations come together to form new short- and long-term commitments to tackle the big stuff. In five years, the gathering has gathered more than 125 current and former heads of state, 15 Nobel Peace Prize laureates, hundreds of leading CEOs, heads of foundations, major philanthropists, directors of the most effective nongovernmental organizations, and prominent members of the media. These CGI members have made more than 1,900 commitments valued at $63 billion, which have already improved the lives of nearly 300 million people in more than 170 countries. The CGI community also includes CGI University (CGI U), a forum to engage college students in global citizenship, MyCommitment.org, an online portal where anybody can make a Commitment to Action, and CGI Lead, which engages a select group of young leaders from business, government, and civil society. In the first two days of sessions this year, the following astounding commitments have been made. This was the most inspiring few days I could imagine last year, as everyone knuckles down and puts their heads together to dream big and then find real world ways to make those dreams a reality. ACS Energy Advisors, in partnership with WorldWater & Solar Technologies, will donate solar-powered water purification machines—which also serve as energy-efficient generators—to provide clean drinking water in Pakistan. Over the next five years, Al Jisr will partner with businesses in Morocco to provide much-needed services, technology, and resources to students, parents, and teachers in 1,000 Moroccan schools. The American Society for Muslim Advancement is teaming its Women’s Islamic Initiative in Spirituality and Equality with the Noor Educational and Capacity Development Organization to increase awareness of women’s rights in Afghanistan and train Imams and mosque communities. Stiller actually started his work before the January quake, inspired by a visit to Haiti in 2009. He has already raised hundreds of thousands of dollars to build schools in the country, in partnership with Architecture for Humanity, Causecast, and the Global Philanthropy Group. I hope I’ll see Ben when I’m there building schools in August. Flashing a little Blue Steel. We are not on the same project, but have the same dream and goal for helping heal Haiti.